FARNBOROUGH, England — As the Trump administration pushes the sale of American weapons as a key part of its plan to grow the economy, America has already eclipsed its overall defense trade total from last year. In an interview with Defense News, Lt. Gen. Charles Hooper, head of the Defense Security Cooperation Agency, said that through the first two quarters of this fiscal year, the U.S. has signed $46.9 billion in weapons sales to foreign partners and allies — smashing past the $41.9 billion figure from all of fiscal 2017. Hooper pointed to the messaging from the administration about arms sales, including the recently implemented Conventional Arms Transfer policy, as helping drive that situation. “Defense exports are good for our national security, they’re good for our foreign policy. And they’re good for our economic security. 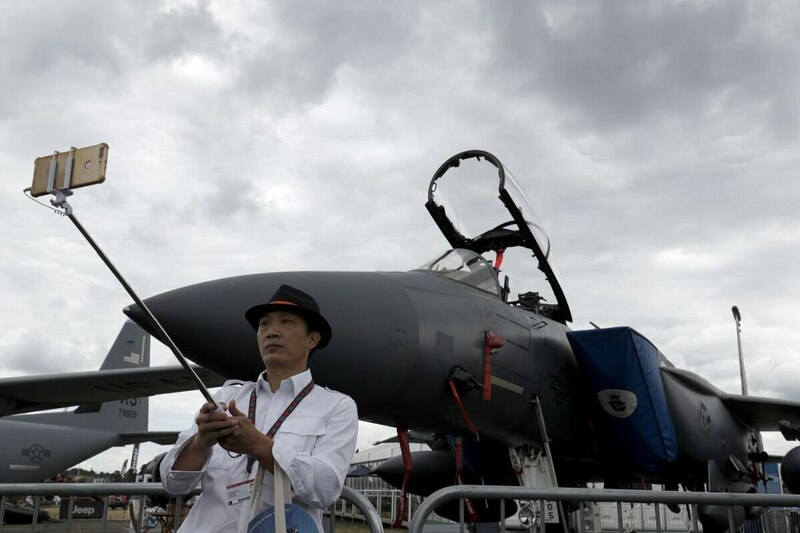 And as the administration and our leadership has said, economic security is national security,” Hooper said during the Farnborough International Airshow on July 18. “So I think the overwhelming response to these changes from our partners has been very positive. In fact, now they’d like to know: ‘How this is going to affect me, how can I take more advantage of receiving the best equipment and best capabilities from the United States?’ ” he added. Click here for more from the Farnborough International Airshow. However, the long-tail time frame for foreign weapon sales means giving credit for this push is difficult. Some of the cases likely date back to the Obama era and were only closed this year, while others will be more recent. And because major defense sales, such as large tranches of planes, can single-handedly boost the dollar figures, it’s hard to predict whether a bonanza is coming for U.S. defense firms. Sales totals tend to be volatile year over year, depending on what partner nations seek to buy. In FY16, sales totaled $33.6 billion, while FY15 totaled just more than $47 billion and FY14 totaled $34.2 billion. There could potentially be problems on the horizon, as well. Throughout the show, industry members were asked if they were concerned about the impact American economic policies, including placing tariffs on traditional allies from Europe, could have on their bottom line. The common refrain throughout the show was that industry is in a wait-and-see mode, although the commercial sector appears most concerned that expected sales of planes and rotorcraft to China could be impacted. For his part, Hooper said that issue has not come up in his discussions at the show.